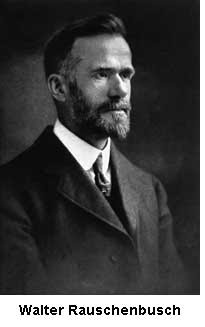 One hundred years ago social gospel founder Walter Rauschenbusch published hte now famous book Christianity and the Social Crisis. in hoonor of that anniversary, his great-grandson Paul Raushenbush published Christianity and the Social Crisis in the 21st century, which includes the text of the original book with a contemporary response to each chapter. This week on Beliefnet, Raushenbush is having a very interesting dialogue on the relevancy of the Social Gospel with Bill Hybels, senior pastor of Willow Creek Community Church. Pastor Raushenbush was right in predicting that he and I would feel essentially the same way on the Sandwich/Jesus issue. Stretching the metaphor a bit, I would add that the acid test for whether a person has indeed eaten the "Jesus" sandwich is whether or not he or she is then motivated to spend every day until the dying day offering both sandwiches—salvation and sustenance—to as many hungry people as possible. One of the great joys of my life has been to pastor a church that is unusually intentional about reaching people far from God. For 32 years now, I have had a front-row seat to observe how lost people get found and how found people get grown up. In my experience, the sandwich question is irrefutably answered as the Holy Spirit does his sanctifying work in the heart and mind of a freshly-redeemed person. What I mean by that is in virtually every case, when I see a life get transformed by the atoning work of Christ, it is not long before that new believer sees the plight of the poor. Usually within months of a person's salvation experience, there is both a sincere desire to pass on the message of Christ to any and all, and an equally intense desire to do whatever is necessary in the name of Christ to eradicate injustice, relieve oppression, and alleviate suffering of any kind. Selfless service of this sort isn’t normal according to human nature; purely and simply, the desires are born out of the work of the Holy Spirit. My point is that if new Christ-followers were not misguided by those who force an either-or mindset to the sandwich question, I am quite sure that the Holy Spirit himself would lead them eventually to adopt a both-and approach. In my teaching and leadership over the past several years, I have relied on two words to help keep our congregation at Willow Creek balanced on these issues: redeem and restore. I love how those two words fall phonetically, but more important, I love how they fall theologically. There’s nothing better than to see new believers around our church begin to weave those words into their everyday vocabulary; better still is when they begin to live them out in their everyday lives. I have to say that I am surprised by our convergence and by this claim. I hope that Pastor Hybels is willing to say more about what form this effort takes in his own church and in evangelical churches across the country, because his description of his church is so different from my perception of evangelicalism in America today. Evangelicals seem to be more concerned with proselytizing and campaigning on social issues such as homosexuality than organizing themselves to meet social needs of the poor. Or is that just my ignorance or prejudice? I continue to associate many of the large evangelical churches more with prosperity preaching (which I consider a modern heresy) than with sustained efforts to relieve oppression and alleviate suffering. Maybe in some minds, prosperity preaching is a version of relieving oppression. However, there are bright spots that, along with Pastor Hybels’ testimony, continue to make me re-evaluate my understanding of the “evangelical agenda.” For instance, the Christian group World Vision has gone into tough places around the world and become almost re-evangelized by their experience of the Gospel as refracted through the lens of the dispossessed. It has made them tenacious and convincing advocates for those whom they are serving. This is similar to what happened to my great-grandfather 100 years ago and why he wrote Christianity and the Social Crisis. I think it may be instructive to those like Rick Warren who dismiss Walter Rauschenbusch as merely a socialist. The product of seven generations of pastors, Rauschenbusch started his career with a fairly orthodox Christian mission of saving souls. His first church consisted of a small community of immigrants in New York City in the area that was then aptly called Hell’s Kitchen. Through his congregation, he was introduced to overcrowded tenements with high rent, horrendous working conditions, intolerably low wages, lack of heat in the winter, and lack of recreational facilities in the summer, all accompanied by constant hunger and substandard health facilities. Rauschenbusch realized that in order to serve the spiritual needs of his congregation he had to address the whole of their lives. As a Christian, Walter naturally turned to the Bible to see what it had to say about harsh reality which confronted him. With his new vision, granted by the poor of his congregation, he saw the “kingdom of God” as the centerpiece of Jesus’ teaching and the hope of his earthly ministry. Pastor Rauschenbusch was struck by how the kingdom of God contrasted with the lives of his congregation: “Instead of a society resting on coercion, exploitation, and inequality,” he wrote, “Jesus desired to found a society resting on love, service, and equality.” Rauschenbusch was convinced that the kingdom of God was not an apocalyptic vision that could be passively postponed, but a prophetic call for society’s transformation in the here and now.